Gov.-elect Larry Hogan and his top fiscal advisor, Bobby Neall, are scheduled to meet with reporters Thursday afternoon, “outlining the status of the state’s current fiscal crisis,” says a press release from the transition. Some Democrats are openly chortling that Hogan will be unable to achieve any of his major campaign promises to cut spending and taxes and create jobs. What are some of the ways Hogan could begin implementing some of his promises without sending Democrats in the legislature to the barricades? The budget situation — a $300 million deficit this year, $600 million next year and more in following years — could be an opportunity. Except for some unrealistic progressives, there is general awareness that the state budget is stressed, and all the budget tricks have been played out. Special funds for open space and the Bay have been raided, replaced with bond debt, and the payments on that debt are now starting to come due, further straining the budget in future years. Faced with similar bad news in the past, Gov. Martin O’Malley made what he called “tough decisions” to raise taxes and fees and to restrain budget growth — hence the $9 billion in “cuts” to mandated spending he would often tout. As a chart from the Department of Legislative Services points out below, while the governor exercises significant budget control, to a great extent his hands are tied by mandates, formulas and entitlements. Over 80% of the budget is governed by laws passed by the General Assembly and signed by previous governors. To make significant budget changes, Hogan must target where the bulk of the money is spent — education and health care. He has to ask the legislature to change the laws funding for those areas. About the best Hogan can achieve is flat funding in those areas, allowing for zero budget growth. Making significant cuts in those areas needs legislative approval and is politically unfeasible. “Republican governor wants to cut funds for the kids” is not the headline Hogan needs as he takes office. Education advocates and the teachers union will scream that flat funding as enrollment grows is essentially reducing aid per pupil. Health advocates will continue to push for expansion of health insurance coverage, even as federal funding under Obamacare tapers off. Contrary to the impression that O’Malley made no budget cuts, he significantly restrained the growth in spending by agencies not related to education and health care. There has been substantial growth in the number of teachers and university faculty and staff. There has been little or no growth in jobs or salaries related to social services and law enforcement. Many of those positions continue to be underpaid by the state compared to what is paid by the federal and local governments. Salaries: One of the drivers of future structural deficits is projected pay increases for state workers. For the time being, forget about pay hikes for state workers, at least in Hogan’s first year. Hogan has considerably more leeway in transportation spending. Gas tax hikes have given a major infusion of funding there. Two multibillion-dollar transit projects are prime targets. The proposed east-west Red Line in Baltimore City is likely dead, and the Purple Line in the D.C. suburbs is endangered. Both have substantial support from the political and business establishment, but there is major local opposition as well. This will free up some money to restore the highway user revenues to the counties that was severely cut by O’Malley, choosing to fund teachers (who supported him) over construction workers (who did not). Gas tax: Hogan may feel the need to trim some of the gas tax hike that will go up automatically since Congress is not likely to authorize the Internet sales tax that would have prevented a major increase next year. Waste, fraud, abuse: The Hogan campaign has made much of $1.75 billion in “waste, fraud and abuse” uncovered by legislative audits. Unfortunately, those are not line items in the budget, and ferreting them out may not produce immediate results. The state budget grew about 4% a year under O’Malley — a lower growth rate than previous governors. Hogan’s budget will certainly grow less than that. If he can find a way to have zero growth, he will. Bond authorization: Some of the bonds used to replace dedicated funds have been authorized but not sold. To save money on growing debt service in future budgets of his term, Hogan may ask to have those authorizations repealed. Accomplishing the other half of his campaign promise is particularly hard to do — rolling back as many of the tax increases of the last eight years as he can. The rain tax: Hogan has promised to seek repeal of the “rain tax,” an easy promise to keep since it has no impact on the state budget. As Democratic legislative leaders have made clear, this state mandate for 10 counties to pass the stormwater remediation fee is not likely to be repealed in the face of intense opposition by environmentalists. But it can be modified so that funding for pollution controls doesn’t require a separate local tax. Business taxes: Hogan needs to show some progress in reducing taxes on businesses. Like average taxpayers, businesses have also paid the added sales and gas taxes, and the added fees. Reducing the personal income taxes that many small business owners pay will be difficult, since they are a major source of state revenues. But Hogan could provide some relief on the personal property tax business owners pay and on the corporate income tax, which was raised in 2007. Personal property tax: The state no longer collects a tax on business assets, but the counties do collect the personal property tax from all businesses and even from many nonprofit organizations, other than schools, churches and hospitals. It is a major source of annoyance and paperwork for businesses large and small. In exchange for the return of highway user revenues, Hogan could suggest elimination or a major reduction of the personal property tax. This would both reduce expenses to businesses of every size and provide a major competitive advantage with Virginia. It also does not cost the state budget anything. Corporate income tax: Another move that might have strong bipartisan appeal is for Hogan to embrace the “combined reporting” method of corporate taxation, along with a major reduction in the corporate tax rate to make it revenue neutral. This would have limited impact on Maryland-based businesses. It requires national corporations to add up all their revenues, then pay taxes based on their percentage of sales in the state. Combined reporting has been proposed by liberal legislators year after year as a way to make corporations pay their “fair share.” The proposal has been studied and rejected repeatedly by legislative committees and a study commission. There are winners and losers with this method. Utilities and manufacturers would pay less and major national retailers and financial service firms would pay more. Half the states already use this method, and it seems like a fairer way to tax big corporations. 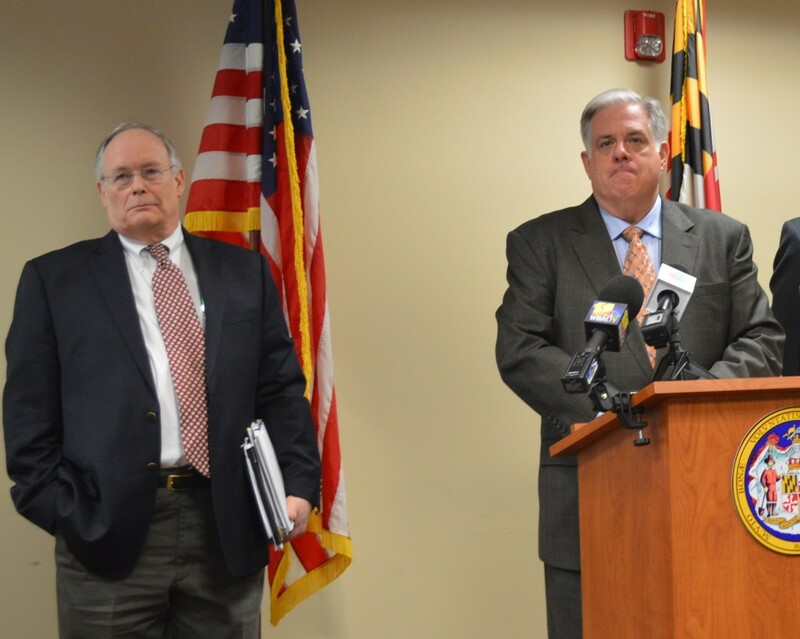 It could allow Hogan to reduce tax rates without costing the state substantial revenues. Former state Sen. Bobby Neall has come up with creative budget solutions in the past, and he may have other ideas for fixes that will help Hogan achieve his campaign promises. Gov. Larry Hogan Jr. must be doing something right in his first few days in office because he’s got nearly everyone upset about his $40 billion budget. Republicans and Democrats, liberals and conservatives, lobbying groups of all shapes and sizes are griping about parts of the new governor’s spending plan. That’s a good thing.